The Motorola Atrix 4G is one of the newest Android powered phones and features high end dual-core processor the Tegra 2. It has 16 GB of internal storage as well as a microSD card slot that could hold up to an additional 32Gb of storage. The large 4 inch touch screen works well with the 5 mega pixel camera and video capture. The phone also features both a HDMI port as well as a USB port. As far as performance go this phone is generally speedy and runs programs and applications quickly. As this is the most powerful android smartphone available when it comes to processors, there are still some kinks that need tobe worked out. In testing it experienced random moments of slow program running as well as a glitch every once and a while. In general it received great reviews but it will come down to individual preference. The Samsung Indulge is a droid powered phone running on the 2.2.1 android system. It is available through MetroPCS and starts at $399 without a contract. The phone is smaller and features a 3.5 inch TFT screen which displays a 320 by 480. The slider keyboard is supposed help with texting however the small keyboard may prove to be difficult for those with large fingers. The camera is only rear facing and does not feature any front facing option. It is a low quality camera only featuring 3.2 mega pixels and 480 video capturing abilities. While the camera is a smaller build, it is rather heavy for its size, a unattractive feature for some. The touch screen is powered by Touchwiz that has been used for many other android powered smartphones. The phone operates at a fine speed although it is not the speediest of choices when it comes to android phones. Samurai 2 Vengeance has only been available on the Android market since the end of February and has already received thousands of downloads. This is the second edition of the game and there are visible improvements in graphics and game play. 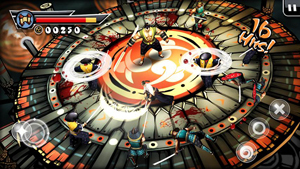 Samurai 2 has been made to work at its highest optimization on Android phone systems. The developers of the app have spent a year improving all aspects of the game and paying close attention to fan reviews and feedback. The game features a virtual joystick and runs at an impressive sixty frames per second. One of the improvements is the multiple views that the dynamic camera allows. The perspective helps gamers stay focused on the fight at hand and at the same time adds variety. The cost for the app is $4.82.